We decided to try to build our first Nanocoaster today. 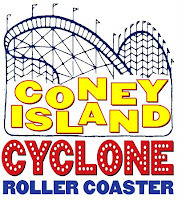 This is the Coney Island Cyclone model. As you can see, the kit consists of the base board, a metal sheet with pop sections and an instruction paper. Once you figure out how to pop out the sections, things move pretty quickly. Just remember to pre-bend the pieces before you try to insert them in the base board. One thing I found interesting is that you really don't build the entire coaster, just the parts that will be visible from the obvious angles. By the time we got to step 3 we realized that it wasn't always one piece per step. So here is the Step 3.5 where we had to go back and add a piece. By the time we got to step 5 we had most of the pieces in place. We then took the time to go back and shape some of the curves a little better. The addition of the station was a little tricky to navigate and place both tabs in their correct slots at the same time. 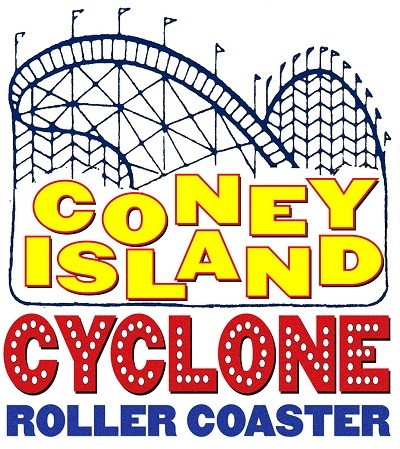 The final touch was the addition of the CYCLONE sign on the lift hill. Here is the view from the back of the ride. Looking down from above, you can see what I meant earlier about it not really being a complete circuit in some places. A couple of profile shots to end this report. We'll probably get a few more of these in the future as this one proved easy and fun to build. I honestly feel it turned out pretty nice.